It’s true! I’ve been waiting for a price drop and now it’s here! Will I be buying one now? I don’t know! Maybe! I’ll probably end up saving for a new laptop so I can play this. 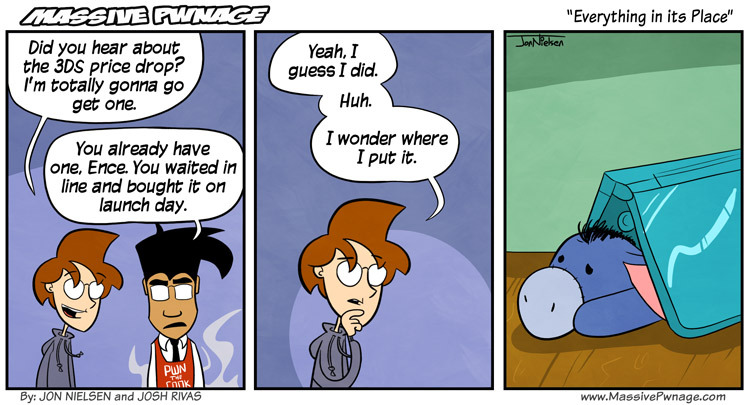 This entry was posted on Friday, July 29th, 2011 at 12:00 am and is filed under Comics. You can follow any responses to this entry through the RSS 2.0 feed. Both comments and pings are currently closed. On an unrelated note (since I don’t have anywhere else to put it) I’ll be ready for game night when I get back home. Which is sometime early September. 600-700ms ping just won’t let me enjoy myself. No one remembered Eeyore’s birthday. That’s alright. He didn’t expect you to anyway. At least he has this nice new shanty that no one wants anymore. They’ve kind of cornered the market in being blue and unwanted.